Education and schooling is not a prominent theme in Adeline’s memoir, as her home and family is, but she does write about it briefly in some instances. From these passages we can decipher her opinion on her schooling and education as a whole. From Adeline’s memoir I could see a change in her attitudes towards her school life. She first describes school as: ‘A terrible place. It was the rule of the rod, and parents had no redress. It was supposed to be good for us. The lessons were very monotonous. Reading, writing and arithmetic’. Though her early memory of school is not positive, she goes on to become a pupil-teacher and then spends her adult life as a secondary school teacher. Her change of heart about education could be due to how her education really affected her and her understanding that education is actually very important for working class children. 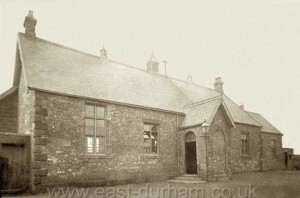 Built in 1865, where Adeline would have first attended school. Adeline’s parents have contrasting opinions on their children’s education. The memoir tells us that her father, ‘was no scholar.’ but, ‘He bitterly regretted this all his life and was determined that we should not be like him’. Her father did not attend school as his family could not afford it, and was not offered any other education opportunities. 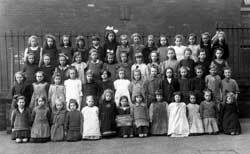 This shows the change over time and generations in schooling, and what was on offer for working class people in the late 1800’s. Adeline’s mother was less ‘determined’ for her children to be scholars, though not in a highly negative way. She had been raised to value domestic work more than school work and in Adeline’s mother we see a ‘teacher’ of a different kind. Adeline writes, ‘When you reached the top standard the boys got drawing and the girls sewing. A garment like a nightdress would be produced by each pupil and that was all. We learned all we ever knew about sewing and knitting from mother.’ She also reflects upon how educational ‘knowledge’ and her mother’s ‘wisdom’, which could be described as common sense, are valued differently. She writes, ‘she (mother) could read a letter but was otherwise no scholar, but we were all decent scholars yet she had more wisdom than we had’. I believe this is Adeline showing respect for her mother, though she was not ideologically ‘intelligent’, her wisdom of the home and domestic sphere is worth more than any education can provide. This representation portrays perfectly Adeline’s opinion of her education, whereas she knows it is valuable to her and her chosen profession, she continues to acknowledge that it does not define her life as a working class girl.